The US State Department announced today that it has amended the terror designation for Al Nusrah Front, al Qaeda’s “affiliate in Syria,” to include the “alias” Hay’at Tahrir al-Sham (HTS). Abu Muhammad al Julani, the leader of Hay’at Tahrir al Sham. However, the rebranding mentioned by Sales has become especially controversial within al Qaeda and jihadi circles, with some HTS critics charging that the group’s emir, Abu Muhammad al Julani, has actually broken his bayat (oath of allegiance) to Ayman al Zawahiri. And the al Qaeda head has issued a series of messages criticizing the group, either directly or indirectly. Al Nusrah was once an official branch of al Qaeda, a fact that it trumpeted in its propaganda and messaging. In July 2016, the group was rebranded as Jabhat Fath al-Sham (JFS). Julani, the leader of Al Nusrah/JFS, said at the time that his renamed organization would have “no affiliation to any external entity.” This ambiguous phrasing was widely interpreted as a real and hard break from al Qaeda, despite some obvious problems with that interpretation. Indeed, a senior HTS official known as Abu Abdullah al Shami later wrote on his Telegram channel that the “idea of the project [meaning JFS] was to change the name of the group…and announce what would be understood in the media as breaking the ties with al Qaeda.” However, according to al Shami, “there would remain a secret undisclosed allegiance to” al Qaeda’s leaders, “in a state which would resemble the situation before our dispute with ISIS.”** Al Shami meant that JFS would, as of July 2016 and in the months that followed, maintain a secret oath of allegiance to Zawahiri, just as Al Nusrah Front had prior to the outset of its conflict with Abu Bakr al Baghdadi’s Islamic State more than three years earlier. Al Shami also wrote that Julani told Zawahiri’s deputy, Abu al Khayr al Masri, who was then based inside Syria and subsequently killed in a US drone strike, that he (Julani) wouldn’t move forward with the rebranding if Masri objected. But al Masri publicly approved of the move and Julani announced the relaunch in July 2016. As al Qaeda onlookers noted at the time, Julani dressed like Osama bin Laden for his big announcement, which included effusive praise for Zawahiri and bin Laden. Regardless, Julani’s move proved to be controversial behind al Qaeda’s closed doors. Al Shami, who argued that JFS was a first step toward a real break, claimed in his testimony that other members of al Qaeda’s senior management — including Saif al Adel, Abu Muhmmad al Masri and Khalid al Aruri (Abu al Qassam) — rejected the move. Al Adel and al Masri were based inside Iran at the time, al Shami said, so some in JFS thought that their ruling should not matter, as they were in an “enemy state” (Iran). Abu al Qassam publicly rejected al Shami’s argument, claiming that al Adel and al Masri had “left prison and they are not imprisoned” — meaning they were not impeded inside Iran from weighing in on key al Qaeda management issues. From the outset, the formation of HTS unleashed vitriolic debates within al Qaeda and affiliated jihadist circles. The relationship between HTS and Turkey, alleged dilution of al Qaeda’s Salafi-jihadist ideology, and the “nationalist” agenda of some of its leaders have all been a matter of dispute. Zawahiri himself has critiqued HTS, sometimes in thinly-veiled terms, more than once. Throughout all of this, one of the most important issues has been whether Al Nusrah broke its sacred allegiance to al Qaeda and Zawahiri. On Nov. 28, 2017, around the same time that al Shami released his defense of HTS, al Qaeda produced the sternest warning from Zawahiri yet. Shortly after Zawahiri’s message, an al Qaeda communications official took the rare step of publicly refuting one of Abu Abdullah al-Shami’s claims, saying that the HTS loyalist was lying about the group’s ability to contact al Qaeda central. Other problems have arisen. Sheikh Abdallah Muhammad al Muhaysini, an al Qaeda-linked cleric who has his own base of support inside Syria, resigned from HTS in Sept. 2017, citing multiple issues. Others within HTS apparently had it out for Muhaysini. HTS subsequently jailed two Julani critics, who are also Zawahiri loyalists, for a time. They were only freed after a mediation council was established. Another al Qaeda veteran who rejected Julani’s July 2016 rebranding, Abu Hammam al Shami, has also had his quarrels with HTS’s leadership. An arbitration resolved that dispute, but it is rumored that Abu Hammam is the real leader of another suspected al Qaeda entity, the “Guardians of the Religion,” which announced its presence earlier this year. The State Department did not explain its reasoning or cite the evidence upon which it based today’s announcement. It is possible the US government has additional intelligence on HTS and its relations with al Qaeda’s senior leadership that is not readily available to the public. While Zawahiri has rebuked HTS, he has also not officially disowned the group or Julani, as al Qaeda did with Baghdadi and the Islamic State in 2014, and this raises other possibilities. The State Department continued to refer to Julani as an al Qaeda man well after the formation of HTS in Jan. 2017. In May 2017, State announced a reward of up to $10 million for information on Julani’s whereabouts. 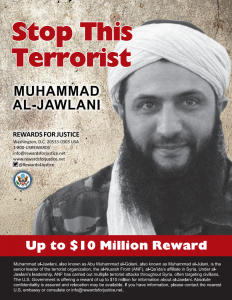 The notice referred to Julani as the “senior leader” of Al Nusrah Front, the “Syria branch of al Qaeda.” Despite forming HTS, Al Nusrah “remains al Qaeda’s affiliate in Syria,” State claimed at the time. Still, there is no doubt that al Qaeda has suffered a leadership crisis in Syria. There is likely much the public doesn’t know about these serious disagreements, but they are real and well-attested by a number of sources. And the US government hasn’t explained why it still considers HTS to be in the al Qaeda fold. *Note: The spelling of al Qaeda has been made consistent throughout, including in quotes from the State Department. **Abu Abdullah al Shami released his testimony via Telegram on Nov. 29, 2017, noting that it was previously disseminated privately among the jihadists. After having supported Al Qaida in Syria during years, the US suddenly realize it was bad policy. And ask, why wasn’t this terrorrist group designated as such by the US government long before it finally just got around to listing it as such? The US involvement in Syria has many dark and morally questionable chapters in it; a fact, which few Americans are awarevof in the least.